Who would like to win a lovely big stack of new books? To celebrate the latest edition of the Gladiator School series of books, we’ve got a great giveaway for one lucky reader to win the full set. 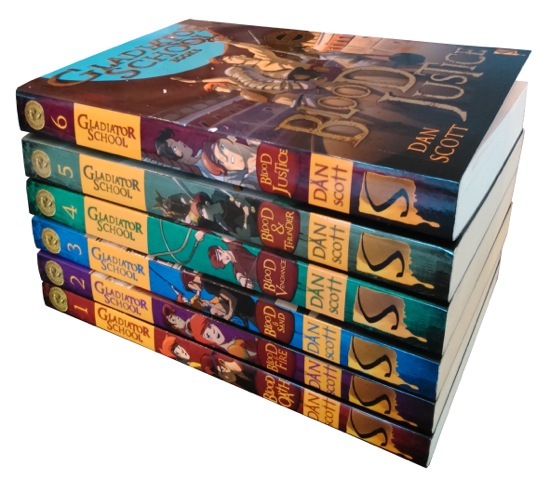 Gladiator School: Blood Justice by Dan Scott is the sixth title in Gladiator School series, and it’s published on 5th March 2015. This series of novels is set in the rich and textured world of Ancient Rome, where heated battles, fierce loyalty and even fiercer rivalry exist alongside one another. Lucius and Quin return to Rome with the chest of Parmenion’s papers proving that Titus was poisoned. But who will believe them? And more importantly who can they trust? Before they can argue their case, the two brothers are framed for the murder of their own father. They now face the most terrifying punishment allowed by Roman law. Blood Justice is a whirlwind of new friendships and old enemies sought with trials and tribulations. But who will be found guilty in the end? And will there be justice? Special features of the book include a map, an illustrated guide to the characters and gladiators throughout the series and two removable coloured card bookmarks. Gladiatorial terms are also explained at the bottom of the relevant pages. Through vivid scenes of action and adventure, Gladiator School brings the world of Ancient Rome to life for boys and girls of age 9 years and upwards. Alex Woolf, writing as Dan Scott, loved to read science fiction and spent his spare time inventing new worlds and dreaming up fantastical machines. Then he went to university and discovered a passion for History. Since becoming a full-time author, he’s put these two enthusiasms to good use. He has written works of science fiction, including the Chronosphere series, about a future world in which time could be bought and sold – and historical fiction, including Aldo Moon and the Ghost of Gravewood Hall, about a teenage Victorian ghost hunter. In 2014, he managed to combine his two obsessions in the steampunk series Iron Sky, where he combines an alternative nineteenth century with science fiction gadgets and machines. Prize value is over £40. These books are suitable for readers aged 9 and over. My boys would love these books! I would want to learn how to fight with weapons used by the gladiators of ancient Rome! I want to learn about the battles! I want to get a feel for what the gladiators felt like. I want to learn how to fight. My son would love to win these, and I think he would choose sword fighting as the thing he would learn. I think I would just run away! I think I’d make a pretty good Gladiator already, so maybe I’d just enjoy all the feasts and decadent parties. My little boy tells me that he wants to learn the history behind the Gladiators! i really want to learn how to battle with swords and shields. Before anything else I would master the skills of using the shield to protect me from some of those fierce weapons! How they trained and how they felt. Great prize! Swordsmanship – definitely. My boys would be interested in learning about fighting! How to use the swords :)!!! Always good to have books around – My little group at school would love these. I really liked your post and I will really like some new school books!